VESTAL, N.Y. – Redshirt-junior Christian Lutete (Silver Spring, Md.) 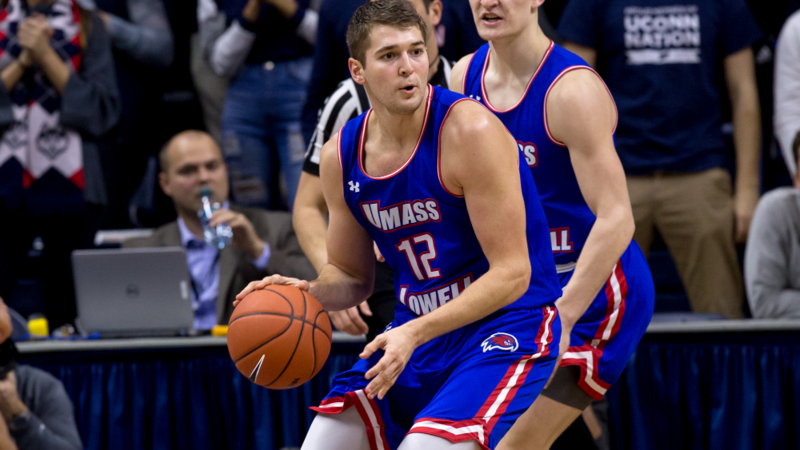 paced four double-digit scorers for the UMass Lowell men’s basketball team (12-9, 4-2 AE) in another exciting, 85-79 come-from-behind victory at America East opponent Binghamton (5-15, 1-4 AE) on Wednesday. The River Hawks trailed by as many as 14 in the second half and were still down by double-digits with less than 10 left to play until freshman Alex Rivera (Lowell, Mass.) and Lutete combined for five points, sparking an 18-5 run that was capped off by three straight buckets from sophomore Obadiah Noel (Frederick, Md.) to put the visitors on top, 73-72, at 3:40. The Bearcats knotted the score for the final time at 75-75, but a triple from Noel gave the River Hawks the lead for good, as the squad sealed the decision with free throws by Rivera and redshirt-senior Josh Gantz (Grove City, Ohio) in the final minute. With the victory, the River Hawks extended their win streak to four games, which sets a new program best in America East action. The decision also ties the program’s Division I record for single-season wins with 12. Noel finished the night with 16 points and a team-high nine rebounds, while Gantz added 16 points of his own with six assists. Rivera rounded out the scorers in double figures with 13 points. The Bearcats jumped out to a quick, 7-1 advantage, but buckets from Noel and Lutete cut the difference to just one. The River Hawks were back within one twice more in the opening minutes before Gantz tallied seven straight points to give his squad its first lead of the night, 15-14, with 14:41 remaining in the first half. UMass Lowell would lead once again at 23-22 following a triple from freshman Allin Blunt (Bowie, Md.) and a layup from Noel, although Binghamton used a 9-2 spurt to create a 31-25 advantage at 7:42. The River Hawks worked to erase the deficit with back-to-back buckets from Lutete and one from Rivera, but eight straight points from the Bearcats’ Sam Sessoms gave the home team its largest lead of the half, 39-31, with 3:17 to go. However, the River Hawks would outscore their hosts, 8-5, in the waning minutes with the help of threes from Lutete and Rivera to pull within 44-39 at the break. Coming out of halftime, the Bearcats outscored UMass Lowell, 13-4, to take a 57-43 edge with 14:42 still to go. Binghamton would maintain at least a 10-point buffer until the River Hawks started their final run in the last 10 minutes. UMass Lowell now owns a 12-4 advantage in the all-time series against the Bearcats. The team has a bye this weekend but will kick off its longest homestand of the season on Wednesday, January 30 against Maine on NESNplus at 7 p.m.